If you are wondering how to install landscape lighting around your porch and yard, rest assured that it is a good do-it-yourself project. Mary and I installed our own lights by purchasing a low voltage landscaping kit at Home Depot. It was a quick and satisfying Saturday afternoon project. Landscape lighting can be both functional and decorative, but more importantly it lights your path to keep you safe. Like your porch, your steps and walkways should be well lit. There are basically two types of lighting – functional and accent. Functional lighting provides the necessary safety features. Accent lighting is decorative and can highlight specific areas or objects. By pointing your landscape lights skyward, you can add some drama and ambiance to your front porch and home. But most importantly, landscape lighting's main role in life is to keep you safe. Statistically, we know homes that are well-lit reduce the chance of crime and accidents. If you don't want to figure out wiring, then solar landscape lighting may be what you want. Solar lights are ideal for lighting up paths and flower gardens. Solar landscape lighting comes on automatically as the light falls below a certain level and turns off as daylight increases. If you opt to purchase a low voltage landscape lighting kit, then be sure that you have a timer to automatically turn the lights on and off. You can set the timers to come on and off at certain hours of the day. If you'd like to save a little money, check out the Lowes coupon and other Lowes offerings. Tip: Place timers in an area that is easily accessible. We used to have one that was hidden behind some shrubbery and it was very inconvenient to reset the timer. When daylight hours lengthen and shorten, you need to adjust the timer - which is a minor drawback. Motion lights are another alternative if you don't need your landscape lights on all night. They are important for your safety and security. You may want to have landscape lights on the sides or back of your home - areas that you do not frequent at night. No one should ever see the actual source of your lights! Light bulbs should be shielded to prevent glare. Landscape lights should not exceed 20 watts (preferably in the 7 -13 watt range is best). Landscape lights should not be bright but sufficient for task at hand. For example, your lighting should be bright enough to light your steps. Avoid lighting trees. They weren't ever meant to be lit and especially not lit all night. Foliage, to include trees, need darkness in order to grow; don't mess with Mother Nature! Live near saltwater? Select brass or copper light fixtures. You are smart to use extra lights to illuminate your steps. Our eyes need time to adjust from a well lit room indoors to a darker environment outdoors. Usually a porch light is insufficient to illuminate the steps. Space lights evenly and ensure the light is directed downward. For best results place lights at both the top and bottom and along the sides if your staircase is long. If there are only two or three steps you may be able to use one light if its beam is sufficient to light all stair treads. Another great option is to hang sconces on your columns at the top of the stairs. Depending on your porch ceiling, overhead, hanging lantern, or coach lamps can all be used to accentuate your porch and provide great lighting. Try to avoid spotlights near your porch. Although they can provide sufficient light they tend to create glare and make it difficult for people to differentiate between steps. Lighting along the walkway to your porch should overlap to create an evenly lit surface. If your walkway is narrow light only one side. If it is wider than 4 feet, I recommend you light both sides so as not to cast shadows. Place lights on posts at a sufficient height to cast light downward and out on the path. Lights set too low cannot illuminate the entire tread. Lights set too high may be ineffective. Place down-lights on trees or arbors if there is a broader area to light but should not be the only light to illuminate steps. Adding lighting is usually pretty straightforward. There are many DIY outdoor lighting kits available. Adding an exterior receptacle (if one is not easily accessible) should be accomplished by a licensed electrician. Most states allow homeowners to do their own electrical work (with a permit) but we recommend you do this only if you have adequate training. Your primary consideration for outdoor lighting is safety and your priority should be lighting walk ways, steps and your door. Most homes have too little outdoor lighting. Most codes require the exterior door be lit. We often assume that is sufficient for the steps leading to it. But meeting the codes is not really sufficient lighting for the safety of your family and visitors. A few extra lights to illuminate steps along the pathway can save you and others from a fall, plus your home will be that much more beautiful! This is the fun part. Step 1: Determine what area(s) you are going to light and as important how you are going to run the cable. For instance, I ran cable along our walkway adjacent to the house. I also wanted to extend it to the other side of the walkway to cover a small area adjacent to the porch. That meant I had to go under the walkway at one point. Second, I only had one receptacle (and it is located on the porch itself). That meant I had to add an additional exterior receptacle. Knowing these things before you purchase your lighting kit allows you to assess exactly what you will need. Running cable: Running cable under a walkway can be done, either with effort or renting a tool to do the job. The labor method is to dig a trench approximately 8-12" and 3-4 feet long on either side of the walkway where your cable will be placed. Take a piece of pipe (3/4 to 1" in diameter), thread a string or wire through it and secure it on the other end with tape. Cap the ends of the pipe and drive it through to the other side. Take the end cap off and secure the string/wire. Pull the pipe out leaving the string under the walkway and visible on both sides. Secure your cable to one end of the cable and pull it through. Adding an external receptacle for your transformer: Although installing landscape lighting is an easy DIY project, adding an external receptacle should be accomplished by a licensed electrician. Although most jurisdictions allow the homeowner to do their own electrical work, electrical codes, materials, and installation methods are quite different than interior residential wiring. It is well worth the peace of mind having a professional extend your on your home or into your yard. NOTE: All exterior receptacles must be GFCI protected. If you already have an exterior receptacle you will be using ensure it is GFCI protected or replace it with one. No exceptions! A GFCI is the only device that can save your life from electrocution. Laying out your landscape plan should also detail where you need additional electrical receptacles for your transformers. You will need to know how much cable you will need and the number of lights on that cable. Step 2: Use the chart below to determine the cable size you will need based on the information in Step 1 above. Step 3: Place the lights where you want them and drive the light stakes into the ground. Try to place them where they will be protected from weed eaters and mowers if possible. Your yard won't look the greatest if your landscape lights are bumped in all directions. Make sure to leave the wire leads exposed. Step 4: Trench digging time. Trench the length of the cable run about 6 inches. This is low voltage cable so it does not have to be buried 12". However, bury it deep enough so as not to be easily cut by mowers or thatching machines. This cable can be easily repaired if cut. Lay the cable in the trench, attach the clips from the lights to the cable and cover the cable. On the very end of the cable use electrical tape to cover the exposed end. Step 5: Attach the end of the cable to the transformer box. Split the cable into two wires, strip the covering back about 3/4" on each, and attach each end to each of the two terminals. Step 6: Hang the transformer in a safe place near the receptacle to protect it from weather. Also, place it in an accessible location as you will be changing the time periodically throughout the year. Plug the transformer into the receptacle. Set the clock. Set the timer dials to control when you want the lights on and off. You should know the difference between 12v low voltage and 120v standard voltage. You already have 12v low voltage in your home- your doorbell for instance. In order to get low voltage you have to have a transformer to reduce the voltage from 120v to 12v. 120v standard voltage is what you use in your home and what comes directly into your home. A transformer is required. For outdoor lighting it is connected directly to an outdoor receptacle and powers your lights. The bulbs will last longer and have more color options. If you plan to use 120v lighting, I recommend you consult a licensed electrical contractor. How much transformer do you need? Add up the wattage of each bulb you'll be using, and then buy a transformer to match the wattage: 200-watt transformer, 300-watt transformer, etc. 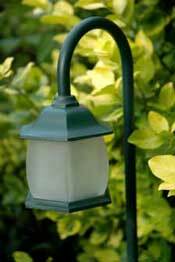 Low-voltage landscape lighting systems can use several different cable sizes. If the landscape lights at the end of your run are significantly dimmer, you are experiencing voltage drop. Note that voltage drops reduce the longevity of halogen lamps. Use shorter cable runs and heavier-gauge landscape lighting cables to prevent this. Here's a quick guide to help you assess what you will need. in any way without our written permission. Front Porch Appeal and a bonus! We will use your email address only to send our newsletter and this helpful ebook on curb appeal! Showing the Difference a Porch Makes! We may earn a commission by referring you to some products on merchant sites. See our disclosure policy. Thank you. By Mary and Dave Morris, Copyright © 2008-2019 Front-Porch-Ideas-and-More.com. All rights reserved. Content and photos may not be reproduced or copied in any way without our express written permission.